If you've already raised some money for Treats & Sweets Day, THANK YOU! Below are tips on how to turn in donations to Pet Partners. When fundraising, encourage your donors to use your online bakery to donate. It is simple and secure, and they are given a tax receipt immediately. If you have a table set up for your bake sale, and great tip is to bring a laptop or tablet with you. Set it up with the Treats & Sweets website so donors can easily give on the spot! Got to treatsandsweetsday.org and click the "donate" button in the top right corner. Click on the "donate" button next to the result that matches who you'd like to support. Enter the amount you'd like to donate. You'll be asked to enter in your personal information and payment as well. Don't forget to provide some words of encouragement for the baker after you submit your payment! You can add other offline donations that you'll mail in, but adding them in as soon as you receive them gives your fundraising goal a quick boost! Log in to your Treats & Sweets account, then click the "donations" button at the top of your dashboard. Click "enter cash/checks" to enter in the gift. When you've filled in all the information, click "submit". Please mail funds to: Pet Partners, Attn: Treats & Sweets Day, 345 118th Ave SE, Suite 200, Bellevue, WA 98005. Use this form to denote who the donation is from and what team/baker this gift should be applied to. 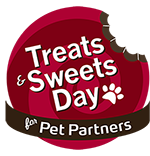 If you have questions about Treats & Sweets Day or need assistance with your fundraiser, please email treatsandsweetsday@petpartners.org.